Tjawina has depicted a series of stories within this painting, the principal story depicts the mythological serpent beings associated with the creation of water sources which are referred to as 'wanampi' or 'pilkati'. These serpents travelled the land both above and below the surface. They were responsible for creating the creeks, rivers and waterholes. These became sacred sites for the celebration of this vital commodity. 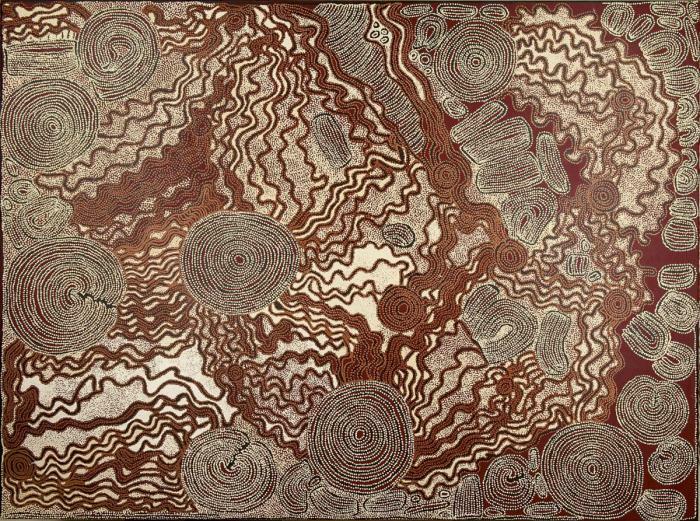 This painting depicts the movement of the snakes as they form the landscape features. The waterholes are depicted as a series of concentric circles, with the linear patterns referring to the markings on the surface of the land. Each of these locations became a significant ceremony site for the purpose of storytelling and initiations. The large 'kidney' shaped icons represent the senior women who conducted the ceremonies. Tjawina Porter Nampitjinpa was born at Yumara, north of the Docker River, in Western Australia around 1950. She is a half sister to Nyurapayia Nampitjinpa (Mrs. Bennett) and full sister to Esther Giles Nampitjinpa, both important artists. 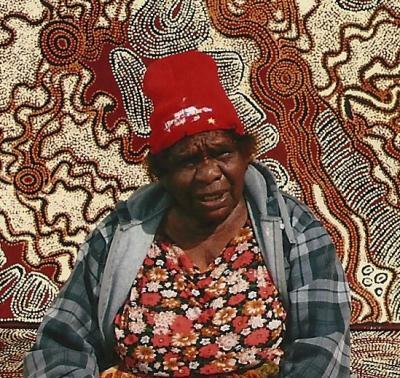 Tjawina grew up "in the bush" with her family. After her younger brother died, her family decided to move to the newly established government settleme . . .